There was a time when most food was local, whether you lived on a farm or bought your food at a farmers market in the city. Exotic foods like olives, spices, and chocolate shipped in from other parts of the world were considered luxuries. Now, most food that Americans eat is shipped from somewhere else, and eating local is considered by some to be a luxury. Renee Brooks Catacalos is here to remind us that eating local is easier--and more rewarding--than we may think. There is an abundance of food all around us, found across the acres and acres of fields and pastures, orchards and forests, mile upon winding mile of rivers and streams, ocean coastline, and the amazing Chesapeake Bay. 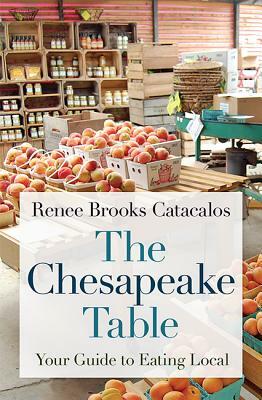 In The Chesapeake Table, Catacalos examines the powerful effect of eating local in Maryland, Virginia, and Washington, DC. Hooked on the local food movement from its early days, Catacalos opens the book by revisiting a personal challenge to only buy, prepare, and eat food grown within a 150-mile radius of her home near Washington, DC. From her in-depth, on-the-ground study of food systems in the region, Catacalos offers practical advice for adopting a locavore diet and getting involved in various entry points to food pathways, from shopping at your local farmers market to buying a community-supported agriculture share. She also includes recipes for those curious about how they can make their own more environmentally conscious food choices. Introducing readers to the vast edible resources of the Chesapeake region, Catacalos focuses on the challenges of environmental and economic sustainability, equity and diversity in the farming and food professions, and access and inclusion for local consumers of all income levels, ethnicities, and geographies. Touching on everything from farm-based breweries and distilleries to urban hoop house farms to grass-fed beef, The Chesapeake Table celebrates the people working hard to put great local food on our plates. Renee Brooks Catacalos, the former publisher of Edible Chesapeake magazine, served as deputy director for Future HarvestChesapeake Alliance for Sustainable Agriculture. She is currently a member of the Steering Team for the Chesapeake Foodshed Network, a regional food system initiative working to catalyze connections and collaborations that build a sustainable, resilient, inclusive, and equitable regional food system in the Chesapeake Bay watershed.